We rely heavily on the state, our politicians and the law. We believe that they keep tabs on everything and that we are protected. However this is only one side of the coin as it’s really all about the money. Industries strive to increase yearly production and earn more and more money in order to stay in business. This includes the chemical industry. This is one of the fastest growing industries and it introduces approximately one new chemical every third second. 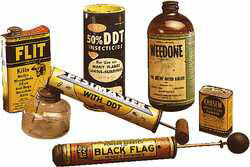 In days gone by products that contained harmful chemicals were marked with a skull and crossbones. Today they are hidden everywhere. They can for instance be found in the food you eat, your clothes, furniture, dyes, industrial products and buildings. When you take into account the millions of chemicals that are produced annually it isn’t strange that these foreign substances are now found all around us and that hundreds of different chemicals can be found in our blood. Not all chemicals are dangerous. The ones that are most harmful are Endocrine Disrupting Chemicals known as EDC’s and those that accumulate in the environment and in human and animal tissue because they are not easily broken down or got rid of. These chemicals can cause serious damage to health and the ability to reproduce and also affect our environment. They are virtually impossible to remove. The Swedish environmental organisation SSNC believes that only 5% of all chemicals registered with the EU has been tested for adverse environmental or health effects. One of Sweden’s 16 environmental goals is a non-toxic environment and states that: “Manmade or extracted substances should not threaten human health or biodiversity”. On a positive note: we are becoming more aware of the need to protect our health and the environment. We are more aware of the need for organically grwon food and non-toxic products. This is a positive trend that we believe is here to stay. And with the help of Toxxscan we can easily discover and avoid products with chemical health risks. Because in the end it isn’t all about the money! We can all affect the future. “But I’ll be tougher than tough and smarter than the smart … And earn my money in an honest way! ” – Scrooge. Picture borrowed from the Environmental Health News.